Are you ready to kill features and benefits? You need to find the one thing about your brand that’s inherently interesting. The one thing isn’t something obvious. Instead, it’s an unusual aspect of your operations or corporate culture that often requires some anthropological thinking to uncover. 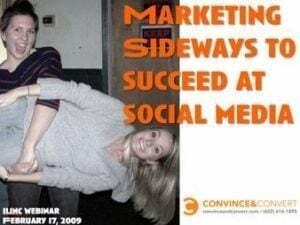 I conducted a Webinar a couple days ago about Marketing Sideways. Sincere thanks to the many attendees. If you missed it, the on demand version is now available here. Just register like you would for the live version, and it will auto-play for you. One of the examples in the Webinar is a fantastic new campaign for Heinz in Skandinavia that is the epitome of marketing sideways. They figured out the ONE THING about ketchup, which is that it isn’t made, it’s grown. And then they built a brilliant social media marketing campaign around that one fact. Talk to the Plant tests the theory of whether language aids in plant growth. They have two tomato plant growing side by side, on a 24-hour live video feed. The control plant just sits there. But the test plant is barraged by verbal messages (15,693 so far). You type in what you want to tell the plant, and a text to speech translator “talks” to the plant live, for you and everyone else to hear. Are you ready to market sideways?